Flag measures: 8" L x 6" H Lightweight 400-denier nylon construction makes flags sensitive to even gentle breezes, giving golfers a better determination of wind direction. Engineered to maintain their good looks despite long exposure to wind and sunlight. Improved steadfast colors, thanks to a patented DuPont process. Unlike heavy sailcloth flags, ours minimize premature wear on sticks and cups, and decrease the chance of flagsticks being blown out of cups. Has a plastic insert with an inside diameter of 5/8" so the flag will move easily in the wind on the marker stick. A smaller hole on the top keeps it from sliding down the marker stick. Sold individually so you can order exactly what you need Perfect for smaller home greens with 1-5 cup holes. 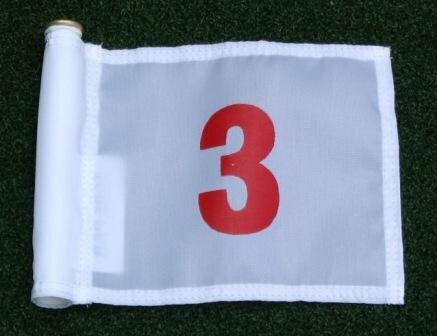 We also offer complete nine Numbered Sets (1-9) and (10-18) in this color combination for use on large greens and miniature courses. Denier which is a unit of measurement that describes the linear mass density of the material, calculated by the mass in grams of a single 9,000 meter strand (reference: one denier is the mass of one 9,000 meter strand of silk). Denier is a good measure of strength and durability when you're comparing two deniers of the same material. For example, a 200D nylon flag is not as strong as a 400D nylon flag sold by ShopTJB. However, when you're comparing between different materials (for example, nylon and polyester) all deniers are not equal. Since nylon is a stronger material than polyester, 400D nylon is actually stronger than 600D polyester.